The last time the Maryland Terrapins played a game at what was then known as First Mariner Arena in downtown Baltimore, they defeated the Iowa Hawkeyes 84-65 in the Big Ten/ACC Challenge. That was on Nov. 30, 1999. Maryland was also looking for déjà vu against Princeton, beating the Tigers 81-58 at First Mariner on Dec. 19, 1998, one of five wins by the Terrapins over the Tigers. Sixth-ranked Maryland started out by trying to establish the three-pointer early, with seniors Jake Layman hitting two of his first four three-point attempts, and Rasheed Sulaimon knocking down one of his own. Princeton responded with two three-pointers and eight points from its top player, Henry Caruso. Maryland went cold from beyond the arc, and the Tigers pulled out to a 14-13 lead when media timeouts were called with 13:25 and 11:38 left in the first half. Princeton pulled out to a 25-19 lead on another Caruso three-pointer with six and a half minutes left in the first half, prompting Maryland head coach Mark Turgeon to call a 30-second timeout. That timeout seemed to spark Maryland. Coming out of the timeout, Maryland went on a 16-6 run for the rest of the first half to take a 35-31 lead at halftime. Jake Layman had a three-point play, Robert Carter, Jr. made a pair of free throws, and Jared Nickens and Trimble hit three-pointers. A floater by Trimble and a three by Layman gave Maryland a 35-27 lead, and Princeton head coach Mitch Henderson had to call two timeouts in less than 15 seconds as the nearly entirely red-clad crowd rose for standing ovations with just over three minutes left. Layman finished the half with 12 points and five rebounds, while Trimble had five points and five assists. Freshman Diamond Stone scored six points off the bench, but Maryland went scoreless for the final 3:10 of the first half. Caruso led the Tigers with 11 points. Maryland started with possession in the second half, and used some crisp ball movement to get the ball to Carter, who found Damonte Dodd with a bounce bass that Dodd finished with a dunk. Carter followed with a jump shot, and Layman answered a Caruso three-pointer with a three of his own to give the Terrapins a 42-34 lead two minutes into the second half. At one point, Carter scored three straight baskets to give Maryland a 48-38 lead with 15 and a half minutes left. The Terrapins started to pull away as Nickens hit a three with the shot clock winding down, and on the next possession Layman slammed home a long alley-oop from Sulaimon to extend the lead to 53-39 with just under 14 minutes left. Princeton pulled to within eight on threes by Devin Cannady and Spencer Weisz, but Stone made a short jumper, was fouled and completed the three-point play to stretch the led back out to 11 with 12 minutes left. After Princeton cut the lead back under 10 with a steal and dunk by Caruso, Maryland went on a 13-2 run over the next three and a half minutes, featuring a combined three three-pointers from Sulaimon and Jaylen Brantley to give Maryland a 20-point lead with just under seven minutes left. Brantley scored 10 out of the 13 points during that run. The Terrapins cruised from there on the way to an 82-61 win before a crowd of 11,076 at Royal Farms Arena. Layman finished with 19 points. Trimble dished out at least 10 assists for the second time this season. Brantley scored all 14 of his points out of Maryland’s final 20 over the final 11 minutes. Maryland (10-1) extended its winning streak to four games, improved to 6-3 all-time against Princeton (6-3) and 10-2 all-time when they play in Baltimore, including six straight wins. Turgeon said his team struggled with Princeton’s zone defense in the first half, and his players too often settled for three-pointers. “Princeton came out in a 3-2 zone; they haven’t shown it all year. We didn’t prepare for it; we weren’t prepared for the 3-2 zone at all, and it showed a little bit,” Turgeon said. “Jake got us going, making some shots, and Diamond gave us energy off the bench, did a terrific job.” Turgeon said his team played up to its potential in the second half, shooting 65.5 percent overall, including 54.5 percent from three-point range after halftime. Maryland held Princeton to just 38.5 percent shooting in the second half. Turgeon says the Terrapins try to base their offense out of the lane, but were rattled by the 3-2 zone. “Our whole offensive strategy was play in the paint, and then they show a 3-2 zone, and I thought we shot too many jumpers at the start,” Turgeon said, explaining that the team really got going in the second half, thanks to better player and ball movement. “We weren’t really ready for it, so we kind of got caught off guard a little bit, so Coach Turgeon called a timeout, and we just ran a play,” Stone said, referring to the timeout Turgeon called with the Terrapins trailing 25-19, followed by Layman’s three-point play. Stone said the team went into its zone offense, and started getting the ball into the paint. He finished with 11 points and six rebounds. “Like Diamond said, I think this is the first time they’ve run that all year, so we definitely weren’t expecting it. I think once we got the ball inside, we kind of calmed down a little bit, and then things started going our way,” said Layman, who went four of eight from the three-point line, and also grabbed eight rebounds. Turgeon spoke about how the city of Baltimore embraced his team, and how he spoke with a couple of fans before the game who said they got tickets to see the Terrapins in Baltimore because they couldn’t get tickets to see them at the Xfinity Center in College Park. He said a trip up to Baltimore is something the team has wanted to do for a while, and would like to make happen on a more regular basis, especially if it can be beneficial for the men’s basketball program. Maryland’s final nonconference game will be on Dec. 27 against Marshall at Xfinity Center. 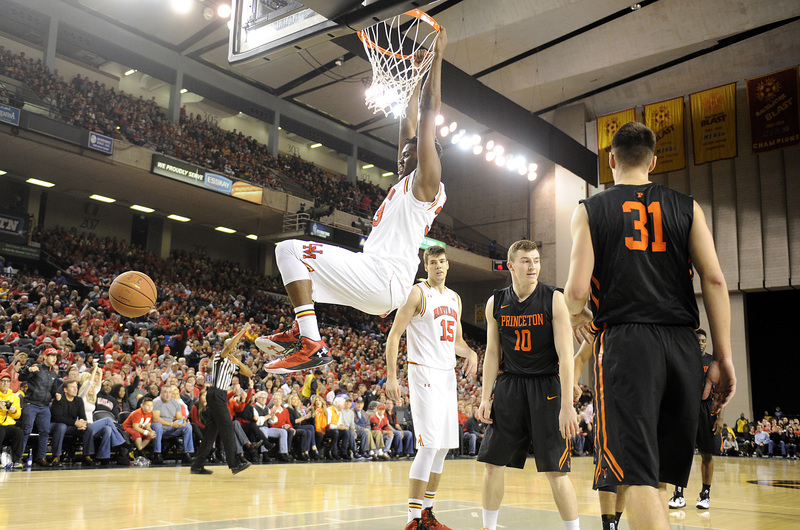 The Terrapins will open its Big Ten schedule on Dec. 30 at home against Penn State.